The male aesthetic norm for chin position is a chin point that touches a tangent line between the mid nasal bridge and the edge of the upper lip. For a woman the chin point looks more feminine if it is about 5mm behind this tangent line. The male chin has a squared contour while the feminine contour is more rounded so round and squared chin implants are available in various sizes to yield a masculine or feminine contour with the right amount of forward projection. The implants are placed via an incision inside the mouth or via an incision on the skin under the chin. In this case a medpor chin implant was placed via an incision inside the mouth. 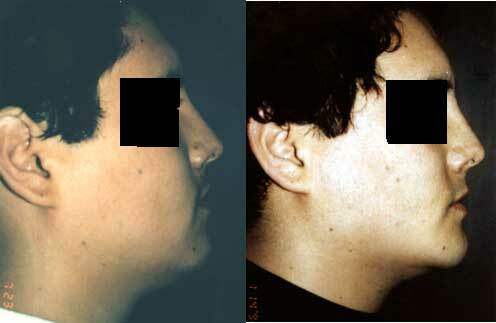 Along with neck liposuction this gave the desired masculine profile. A feminine profile can be achieved by placing a rounded chin implant instead of the squared chin implant. Chin implant surgery can enhance your appearance and your self confidence. Realistic expectations are important to be happy with any surgery. As each patient is an individual, different results can be expected in each patient. Dermal filler and fat injections are increasingly being used as alternative to chin implants because of their lower cost and quicker recovery. Unfortunately they are not a good or equivalent alternative. Surgery on the chin bone itself to move it forward or backward as an alternative has lost favor because of the specialized equipment required, higher cost and longer recovery associated with cutting the chin bone. Temporary loss of lower lip sensation can occur. Rarely this may be permanent. The benefits are a more masculine or feminine appearance depending on the implant shape. Your head is kept elevated, no lying flat or head down position for 1 week. An ace wrap between the chin and vertex top of the head, worn for about a week, helps minimize swelling and keep the implant in position tight against the bone.